By The Politico's Roger Simon. "I am older than dirt and have more scars than Frankenstein," John McCain likes to say. It always gets a laugh, though I don't suppose his mother, who is 94, and her twin sister appreciate it very much. If he is older than dirt, what does that make them? Older than lava? I talked to McCain recently and asked him about his health. He said it was good. "I hiked the Grand Canyon rim-to-rim last August with my son, Jack," he said. I tried to imagine that. The last time I saw it, the Grand Canyon was seriously deep. How on earth do you hike a thing like that rim-to-rim? I asked. "Down and up!" he said. "It takes three days." John Kennedy, who at 43 became the youngest person ever elected president, and who was always associated with "vig-ah," in fact had serious diseases that were kept from the public. As was revealed in 2002, Kennedy was sick from age 13 through the rest of his life, was on chronic-pain medication throughout his presidency and had Addison's disease, an endocrine disorder that until 1940 was a terminal illness. Kennedy survived it through cortisone injections, which at the time only rich people could afford. Dr. Jeffrey Kelman, who examined Kennedy's medical records in 2002, said, "He was never healthy. I mean, the image you get of vigor and progressive health wasn't true." The point being: Electing a young person to the presidency is no guarantee that he or she will be healthy or stay healthy. "We'll probably have to do that again," McCain told me of the record release. Do you think all candidates should release their medical and psychiatric records? I asked. I thought he would jump on that and say yes, just to put pressure on the other presidential campaigns, but he did not. "I don't know," he said. "I think probably in my case it was a little more unique because of my POW status and the war injuries and the fact that people were spreading rumors that I was crazy and disabled both. So we'll probably have to do that again." You think the rumors will start again? I asked. "They already have!" he said. But I don't think that is going to be McCain's problem. It isn't his health but rather his demeanor that worries some people. The Iraq war, which he strongly supports, has disturbed and dismayed him. He told The Washington Post it was a "train wreck." He told me it was a "witch's brew." He visits wounded soldiers and Marines when they come back home for treatment and if any civilian feels the pain of the military, it is McCain. Last April, I wrote of a campaign swing McCain made through New Hampshire and Iowa, "Though McCain said he enjoyed himself, he was not the rollicking campaigner of six years ago. At a number of stops, he was largely subdued and sometimes almost somber." 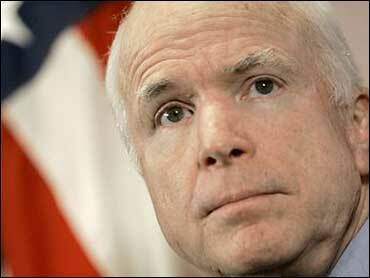 Last Sunday, on "Meet the Press with Tim Russert," McCain seemed to have moved from almost somber to almost gloomy. In my recent interview, I suggested to him that the laughing, joking John McCain of his last presidential campaign seemed to be AWOL. "It's hard to make jokes; we are a nation at war," he said. "There are great national security challenges that we face. But I also believe, as Ronald Reagan did, that America's greatest days are ahead of us. It's going to be an upbeat campaign and an optimistic one." And will you still come to the back of the bus and goof off with the press like before? I asked. "If I changed that," McCain said with a smile of old, "I would probably get death threats."